Where have all the bunnies gone? | Do the twisted. Recently, I went out to find a bunny wabbit for promotional purposes. I figured it was just like old times, you go to a pet store, and lo and behold, there they are. Wrong. I went to two and after expressing my perplexity and concern over the lack of rabbits, the pet clerk told me that I should look into rabbit rescue groups. Um, okay. I just needed a rabbit for a photo op. I couldn’t be entirely heartless. “Hi, I just want to play with your bunnies. No, I’m not interested in adopting.” Besides, if I did adopt, my dog would encourage me to make rabbit stew and that’s not happening. So I decided to call it a failed mission. However, I began to wonder, where are all the stinking bunnies? When I was a kid, it seemed like rabbits were hopping all over the place. They were in books, like Goodnight Moon and The Velveteen Rabbit. They were in movies and TV shows, like Bugs Bunny and “Who Framed Roger Rabbit”. 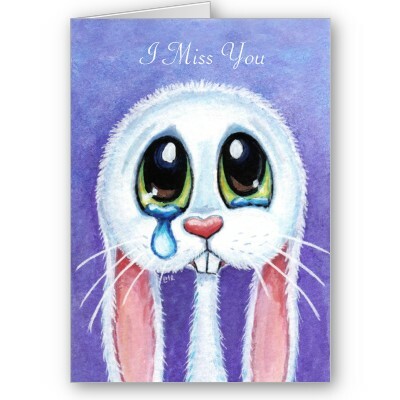 And of course, we can’t forget the silly “Trix are for kids” rabbit. Who knows, maybe since I’m older, I’m missing out on all their appearances. Or maybe that sneaky little Dora the Explorer has them all stuffed in her backpack. Panic attack aside, not all is lost. Luckily, I do know where to find 18 Rabbits. 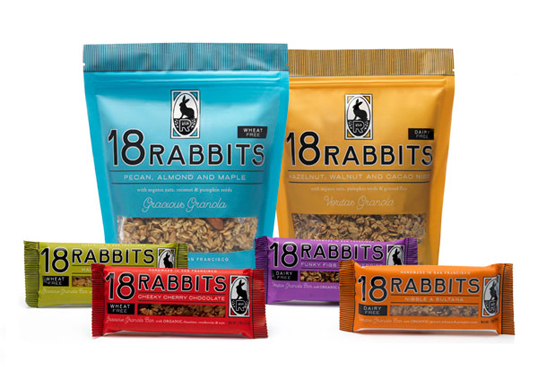 Based out of San Francisco, 18 Rabbits makes delicious, organic granola bars and cereal. They got the name because growing up, the founder/CEO had a pet rabbit named Blackjack who went off to “play” with a wild rabbit and soon had a family of 18 bouncing all over the yard. Years later, Alison Vercruysse created the company with the belief that everyone has a right to enjoy pure, simple food and to feel good eating it. And she’s right. Their products are A+ amazing. Now, I’ve been around the block with granola bars and have enjoyed many. However, I always questioned whether I was really getting a healthy snack or not. They’re always so sweet and sugary. 18 Rabbits has the lowest sugar per serving of any granola on the market and they are by far, the best I have ever had. I swear on my lucky rabbit’s foot. My personal favorite is the Cheeky Cherry Chocolate. I’m going to order a box, thankyouverymuch. So check them out and enjoy the yum. Go on, hop to it. Become a fan of 18 Rabbits on Facebook! She can’t be trusted. 🙂 love you too JB. Great post, Jordan. Let’s not forget “Who Killed Roger Rabbit. Maybe there’s some truth to this after all. There is an older couple who live in my parent’s neighborhood (in the suburbs of Philadelphia) who have a backyard full of floppy eared bunny rabbits. They are adorable! So I presume all the bunnies have moved to the suburbs of Philly.